Summer calls for salads, frosty drinks and fruit, but sometimes the body craves grilled cheese and protein, no matter the heat outside. These are easy-to-make, delicious stuffed mushrooms, with a couple of unique touches and the intense flavor of tarragon. Finely chop the stems and the onion. Saute in olive oil on medium heat until golden brown. Let cool. In a bowl, combine the cooled sauteed mushroom stems, cheese, chopped tarragon, black and white pepper, salt. I recommend oversalting the filling a little, because mushrooms will absorb some of the salt. Lay a little shred of prosciutto into each mushroom, and densely pack the cheese filling over it. I assure you: you can fit all the cheese into the mushrooms. Arrange the mushrooms on a baking sheet and bake at 350 degrees in a preheated oven for 15 minutes. 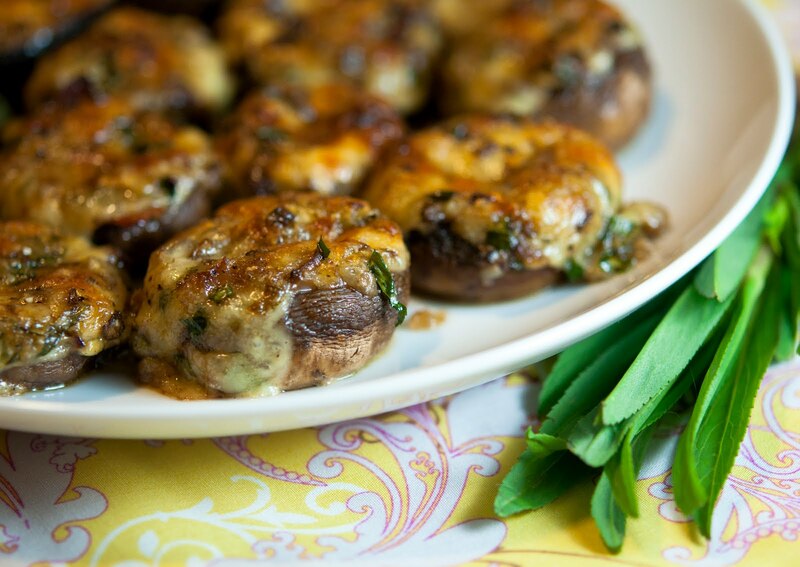 Switch the oven to broil and remove the mushrooms as soon as the cheese has a light golden crust. Serve and eat quickly, while hot! Prosciutto is, of course, optional, but it adds a lot of flavor, so unless you are vegetarian, I recommend it. If you expect guests, the mushrooms can be prepared ahead of time, and just popped into the oven when the guests arrive (or a little before). I want that. :) M-m-m-m. And with rich red (!) wine it would be just a food from heaven. By "large white onion" you mean Vidalia onion, the sweet kind? Love your photo, too. I think we are making some progress.